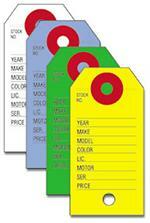 Manila Key Tags, 1000 Per Box. Available Pre-Strung With String. 13 PT. 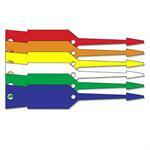 Metal Key Rings/250 Per Pkg. 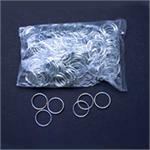 Metal Key Rings 250 Rings Per Pkg. 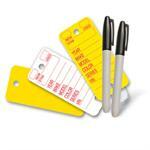 3/4" Key Tag Rings. 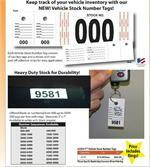 Each Vehicle Stock Number Tag consists of two key tags and a sticker with two peel off strips for easy application. Versa Key Tags Are The Original Self-Protecting Key Tag Is Still The Best. Colors: Yellow, White, Red, Blue, Green, Orange, Tan, Gray, Lilac And Also A Multicolor Box Containing 50 Of Each Color: Yellow, White, Red, Blue And Green.